I had a really hectic week and struggled to find time to get any work done! I managed to squeeze in a lot of exercise, but not a whole lot of work. After my yoga class on Sunday evening, my parents picked me up from Village Mall and we went to Markette at Box Park for dinner. They’d been there for dinner the week before and had liked it. The funny thing is: they both thought the menu was two-sided, but it actually opened so there were four sides to it – they’d missed out half the menu! 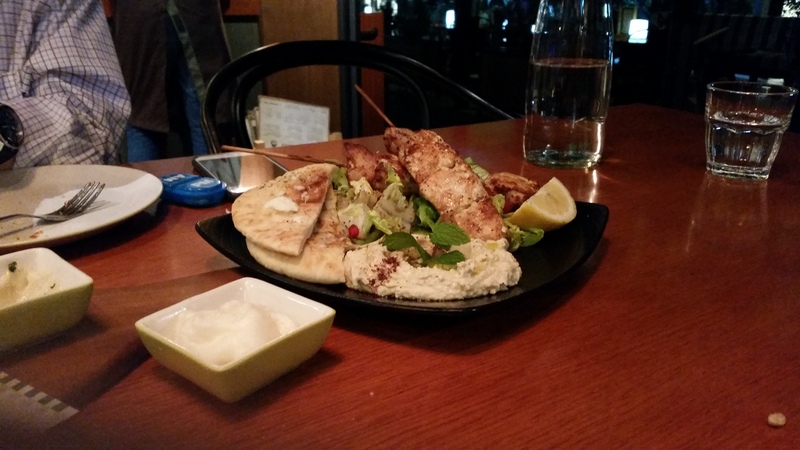 We shared the calamari and shish taouk platter for starters. The calamari was just average, I thought. The shish taouk was very good – the chicken was tender and juicy. 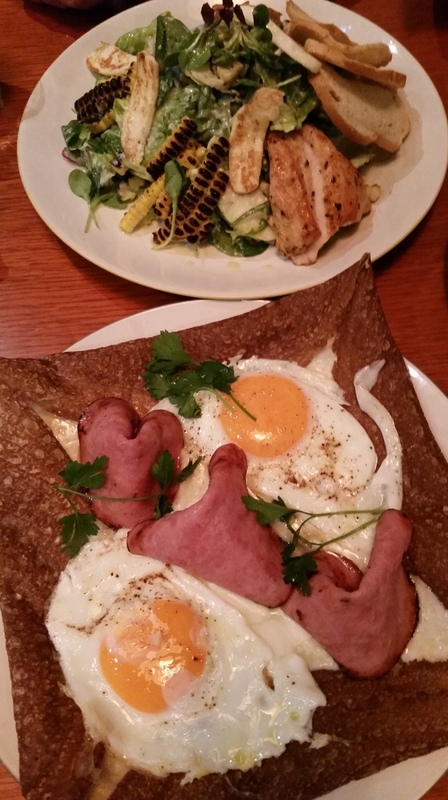 After that, my mum ordered a soup for her main course, my dad ordered the grilled corn and chicken salad and I ordered a galette (an open crêpe, if you like) with turkey ham, cheese and two fried eggs. I was really full after that, not to mention sleepy after my yoga class. Monday was busy – I had a session with Pete on Monday and a piano lesson that afternoon. I also had my Arabic class that evening! An exhausting day. I went to an IBWG lunch at the Trade Centre Club on Tuesday afternoon. I hadn’t been in a while – I was swamped with work during the January lunch and had the flu during the February lunch so I thought I’d better make an effort for March or risk my membership lapsing. I was on a table with just three other women, but we had some interesting conversations. I was home by 3pm and then decided I’d go to a yoga class at 4pm. After that, I worked for the rest of the evening. I woke up on Wednesday and it was pouring! It was so dark outside, I wasn’t even sure what time it was. It usually makes no difference to me when it rains as I barely leave the house, but on this particular day I had places to go. And when 5 minutes of rain leads to 5 hours of traffic, I was dreading it. I had a session with Pete in the morning, managed to do some work until about 3pm and then headed off to DIFC for my meeting at Caffe Nero. It was still drizzling by that time. At 4.30pm I went over to the Conrad as I had a schoolfriend staying there for a few days and we were meeting for coffee. I think the last time we’d met was over 10 years ago – it was nice to see her, but we only managed to spend an hour together as I had to head off to my Arabic class! Thankfully it had stopped raining by then, but there was still a lot of traffic everywhere – and there were only five of us in the class. On Thursday afternoon, a friend came over with her baby for a little while. After she left, I went to Roberto’s for a friend’s birthday drinks. I thought I’d only join them for a bit, and I got there at 7pm, but I ended up getting home at 2am. That always happens to me! On Friday morning I got an email from my client who had sent me the Chinese paper the week before. They wanted me to continue working on it. Were they mad? I told them that I had no idea what I was doing and that it would take too long. They told me they would increase the rate and the deadline. They also told me they’d send it to the author to check before it was published. For goodness’ sake – what good would that do? The author already thought that the garbage he’d submitted was proper English, how would he even understand what I was writing? Anyway, I decided I’d focus on that on Saturday and spent most of Friday working on other things. 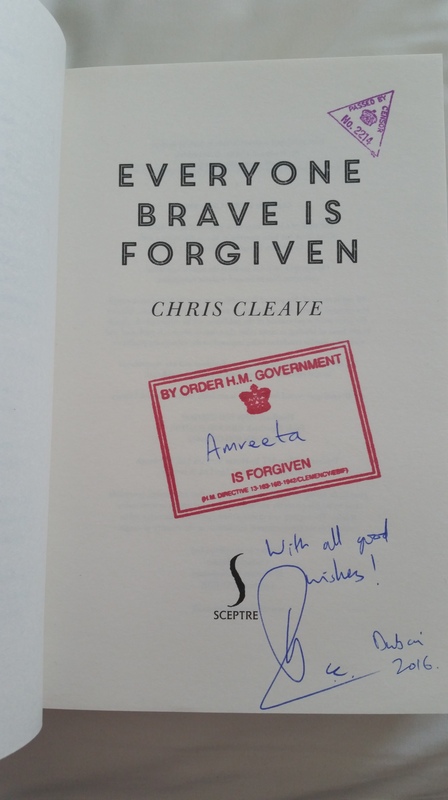 I was up early on Saturday morning as I had tickets to see Chris Cleave at the Literature Festival. When I left the house, I told myself I wasn’t going to buy any books. None. At. All. I got to the Intercontinental at Festival City shortly after 9am and had bought a book by 9.15am. I think someone should host an intervention for me. I bumped into a friend of mine who was attending the same session at 9.30am and we went in together. After the session, we queued up with our books for him to sign. When I got to the front, he shook my hand and thanked me for buying his books. 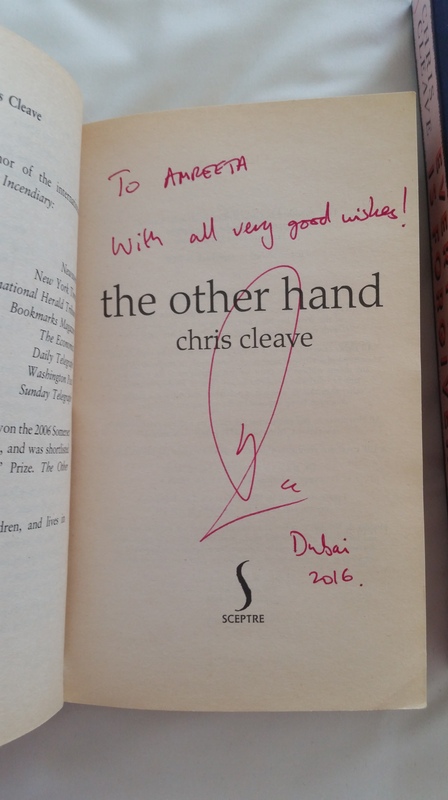 I told him that my copy of The Other Hand had been bought in Dubai and taken to Bali and Nigeria and was finally back with me. He asked me if I’d been to Nigeria and I told him I lived there as a child. He told me he went there once for a week – he said it was fascinating but that he wouldn’t want to live there! I think a lot of people who live there feel like that too! He was really interesting to talk to – and he signed both my books. He said he was running a couple of workshops that afternoon, but when I went to see if there were any tickets still available they were sold out. I had an hour until my next session at 11.30am. My friend and I grabbed a cup of tea before separating for our respective sessions. I bumped into some other friends as well, but on the whole I got the feeling that the Festival was much quieter than in previous years. The next session I attended was called ’14 Centuries of Arab History’. The author was John McHugo – his two books are A Concise History of the Arabs and Syria: A Recent History. The person moderating the session was Riz Khan, who used to work for the BBC and CNN – apparently he lives in Dubai now. I was disappointed by this session – it could have been so much more interesting than it was. I know that one hour isn’t a very long time, but the session was mostly questions from the audience, a bit like ‘Question Time’, so no topic was covered in any real depth. My friend and I met up again after that and walked over to the Belgian Beer Cafe for lunch. It wasn’t too hot, so we sat outside and both ordered the fish and chips. She had another session after lunch and I came back home. 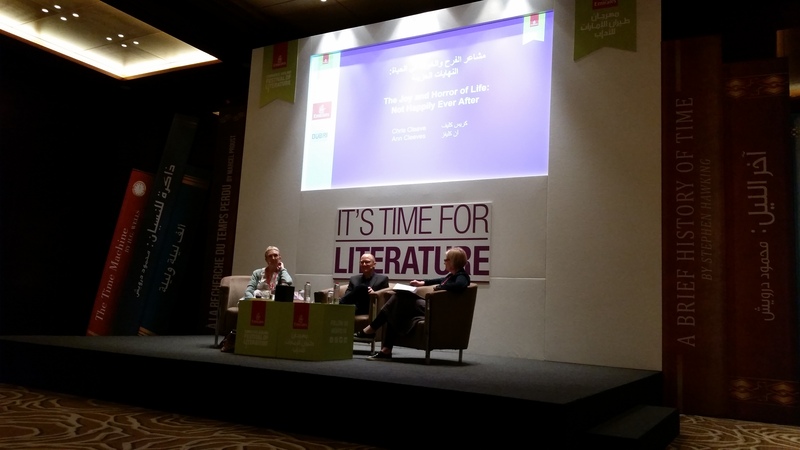 I have to say I was disappointed with the Literature Festival this year. Last year I struggled to fit in all the authors I wanted to see but this year I struggled to find anyone I really liked. After speaking to a few other people, I think that was the general consensus. That afternoon, I had to fight to stay awake while editing the awful Chinese paper, and then I headed to the beach for my evening walk – it was really busy! I was home a little after 7pm and had dinner with my parents.